Hiking Rocky Mountain National Park: Number 100: Chiquita Lake and area. I am beyond happy to say that I was able to obtain my 100th named destination in RMNP yesterday, that being Chiquita Lake! I started bright and early from the Lawn Lake TH. The going is relatively easy at first, with the trail offering some pretty good views and hiking through lush forest. After a few miles, you'll reach the turnoff for Ypsilon Lake. Fairchild Mountain as seen from the footbridge over the Roaring River. I had selected Ypsilon Lake and the area around it thinking it is a pretty popular hike, and the trail there would be pretty well mashed in and defined. At first it was, but as you gain altitude on the moraine, the trail grows less and less well defined. Make no mistake, winter conditions are still here at altitude. Trail finding becomes looking for a slight depression in the snow, errant footprints, and the occasionally sign that you are on the correct path when you posthole into someone elses posthole that has been covered by a small snow bridge. A hare in winter colors. Eventually I lost the trail, or it ended, or both. From here on out, I had to rely on visual cues. Fortunately, I was now high enough it altitude that I could see Ypsilon Mountain, and determined that I was almost directly in line with Donner Ridge. I continued in this direction, gaining altitude all the while. As I started to hit some clearings and got some clear views of the surrounding area, I had a decision to make. It looked like I could just gain altitude on the east ridge of Mount Chiquita and contour around it to the lake, or drop down to Ypsilon Lake before continuing up. I was also planning on going for Spectacle Lakes and Fay Lakes, but it became apparent that those would not happen today since the routes up to both had recent wet avalanches in them. Starting to see through the trees. Looking back to Bighorn Mountain. 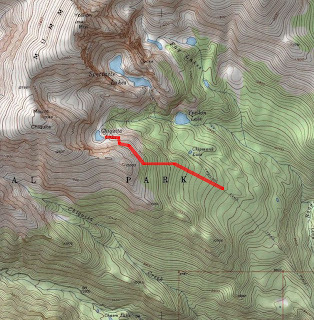 Since I had yet to actually see Ypsilon Lake from where I was, and could look east and tell I was somewhere in elevation between the 11254 of Mount Tileston and the 11483 of Bighorn, I decided to just stay on and contour around the ridge. This provided some obstacles as there was some deep snow at times, and seeing avalanches pretty much all around made me very cautious. I strapped on my crampons, and continued to find my way up and around the slope. The view from where I stopped for lunch. Not too bad! Ypsilon Lake finally became visible at the base of Blitzen Ridge. Though I did have to pick my way carefully, this plan worked out quite well, as I crested the ridge and saw the lake lying approximately 100 feet below me. First views of the lake and Mount Chiquita above. I had to loose some altitude here, by my estimate the high point of my hike was around 11500 feet, and the lake lies at 11340. But no worry, the going was pretty easy here. Corniced snow on the ridge between Ypsilon and Chiquita. And there I was. A plateau followed by another short drop down brought me to destination 100! What a place to be! This will surely be in my top three high altitude lakes of the year. It's surrounded on three sides by the steep cliffs of Mount Chiquita, which lies less than a mile and almost 2000 feet higher than the lake. This high alpine bowl is definitely worthy of a visit. Looking back at the ridge of Chiquita, my traverse route. And down to Ypsilon Lake. I was worried about the possibility of avalanche in this gully, but careful observation showed no slides, and the slope didn't look steep enough in general. This is what falling rain looks like when seen from elevation- grey streaks in the sky. Plunge stepping down the gully was quite fun, and it seemed to go by quickly. Looking up the standard ascent route to Spectacle Lakes. At the current melt rate, this should be good to go in another 2-3 weeks. Looking down and across to Bighorn Mountain from above the waterfall above Ypsilon Lake. Here I encountered some tricky snow, going in up to waist deep at times. On the other side of Ypsilon, looking up. My next goal was to find Chipmunk Lake. My only clue was that the trail that I had lost goes right by it. I gained some leg bursting elevation back up in search of this lake. I had a hard time- the shadows on the snow made me think several times that I was seeing a body of water through the trees. Ironically, it was one of these that brought me to Chipmunk Lake. Just starting to melt a little. And this snowman that had been knocked over on my way up was rebuilt. It was slush city on the way down. The snow is melting, but it will still be awhile before the trail is clear all the way up to the lake. Longs Peak, Mount Lady Washington, Storm Peak, and Half Mountain became visible from the trail back down. When I got back to the truck, I decided to go for a few of the minor destinations in the area. The Alluvial Fan and Horseshoe Falls are right up the road, and a perfect destination for those with very small children or those just wanting a glimpse of the true power of nature and man- these features came into existence after the failure of the Lawn Lake dam in 1982. The resultant flood of water gouged away hundreds of tons of earth in minutes. You can leave the paved trail to scramble to a better view as the people above did. Fan Lake lies slightly west and south of the Alluvial Fan, but it looked like it was almost completely dried up, with just a little bit of marshy area there. Sheep Lakes are right next to the road. Just park, step out of the car, and you're there. This is so named because bighorn sheep will apparently descend from Bighorn Mountain to hang out here. Go figure! All I saw was one lonely elk. And that was my day in RMNP this week, well seized I'd say. Chiquita Lake is a spectacular destination, the main difficulty is the almost 3000 feet of elevation gain required to get there. Once the snow melts, it will become a bit easier, but this would be a pretty solid day by itself. Ypsilon Lake is pretty cool as well. If I were you, I would walk around to the south side for a nice view up to the higher peaks. The waterfall above it is pretty cool, and relatively easy to get to as well. Chiquita Lake: 5.5 miles one way, 2800 foot gain. Strenuous-. Ypsilon Lake: 4.7 miles one way, 2000 foot gain. Moderate+. Chipmunk Lake: 4.2 miles one way, 2120 foot gain. Moderate+. Alluvial Fan: .2 miles one way, 60 foot gain. Easy-. Horseshoe Falls: .3 miles one way, 320 foot gain. Easy-. Fan Lake: .1 mile one way, -20 foot gain. Easy-. Sheep Lakes: view from parking. Easy-. I want to get up to Chiquita this summer. We have yet to do "CCY" either. All I can say it that it is well worth the time and effort to get there!